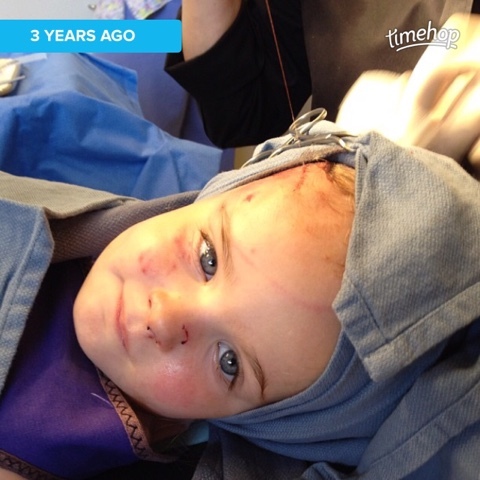 Three years ago, we experienced one of those worst nightmare traumas. One of those things that your instincts warn you about, but you push it aside with a big ol' "nah, that's not going to happen!" only to wish you would've listened when your instincts started waving that giant red flag. 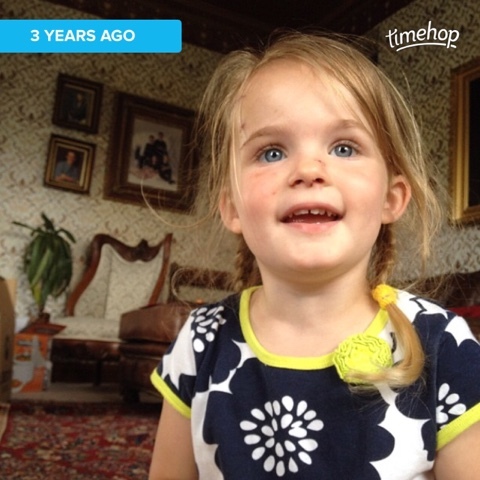 Three years ago, my aunt was getting married and asked me if I could come stay with her and her fiancé for five weeks to help with the wedding prep. She worked full-time at the hospital, dividing her time between the ER and the cardiology department and didn't have a whole lot of time and/or energy to devote to her second wedding. So, I agreed to go. Roo and I packed some things, hugged and kissed hubby/daddy-o at the airport and away we went to our five week home in the middle-of-nowhere, Wisconsin. Sounds exciting, right? My aunt picked us up at the airport, with friendly greetings and warm hugs. 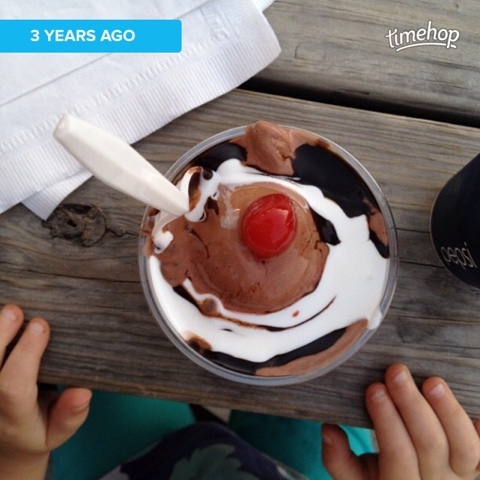 She even took us to a famous custard place for cheeseburgers and, of course, custard. (I can't remember the name of it, I only remember that the President had eaten there the previous summer.) Anyway, while we were en route to the famous custard joint, she told me not to let Roo run in the backyard if the dogs were also out there. 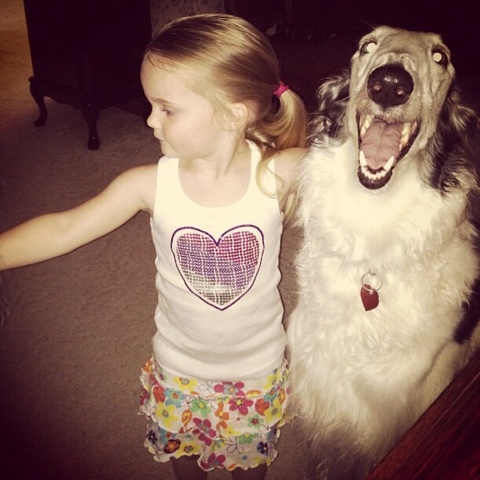 She explained that their dogs, Borzois-or Russian Wolfhounds, were very highly instinctive due to their carefully purebred genes. 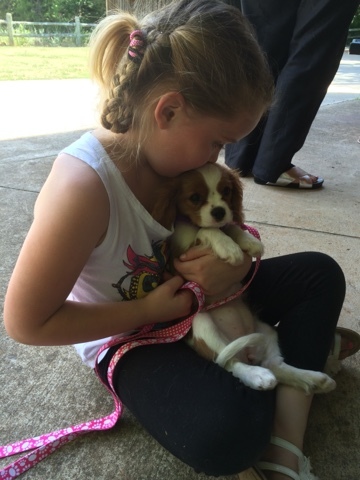 She was afraid that the dogs would run after and attack little Roo if she did. 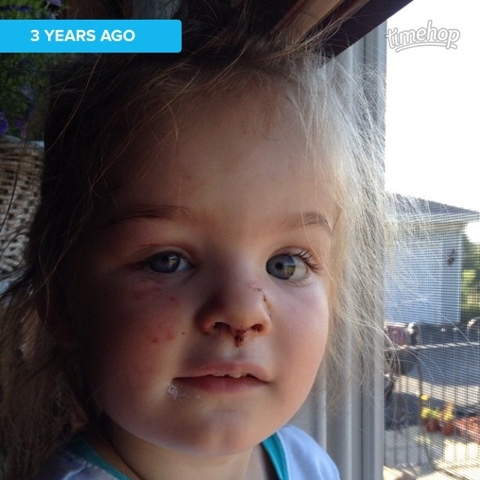 So, naturally, I felt sick to my stomach (hello, instincts) and told her we would be very careful. 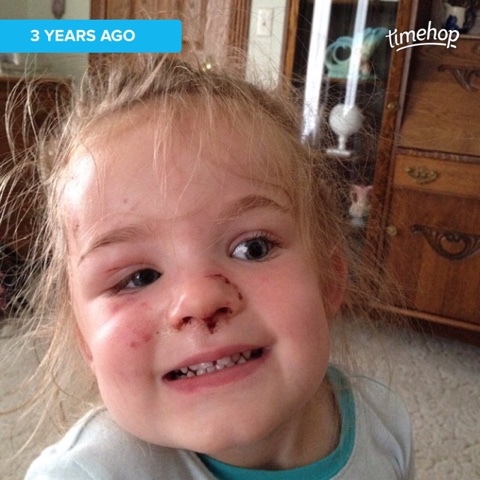 This was my precious baby girl, no way did I want to see her get mauled by a hunting dog! We kept a close eye on the dogs, and were very careful about our actions and movements around them for the next two days. On our third day there, the dogs had gotten used to us being there, and showed virtually no concern for the small human/prey that was temporarily invading their home. We didn't relax, but we started to feel a little at ease. It was the evening of the third day that things suddenly went wrong. I was standing in the kitchen, scraping the spaghetti plates and loading the dishwasher when I suddenly heard the most awful growl and piercing scream. 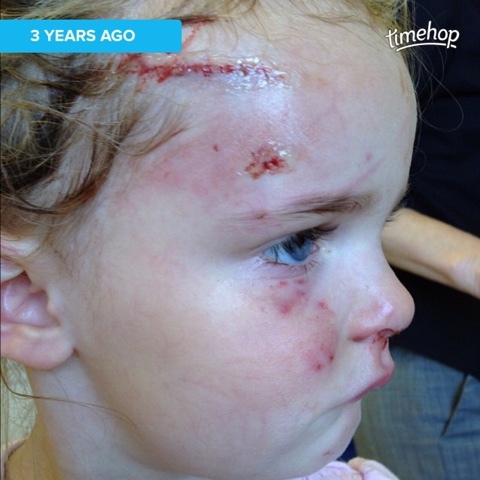 My daughter's head was inside the jaws of the largest of the two dogs and there was blood everywhere. So much blood. 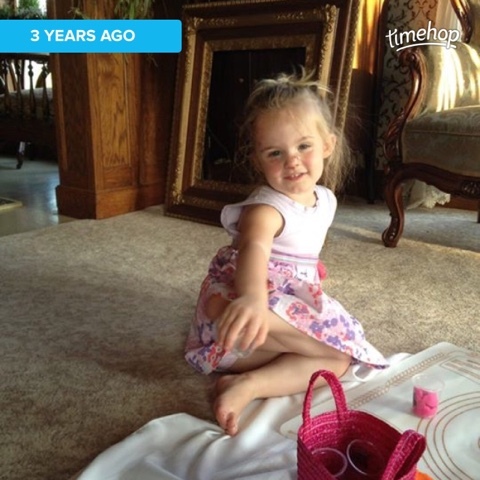 I remember kicking the dishwasher door up and dashing across the floor, to the very spot she's standing in two photos up. 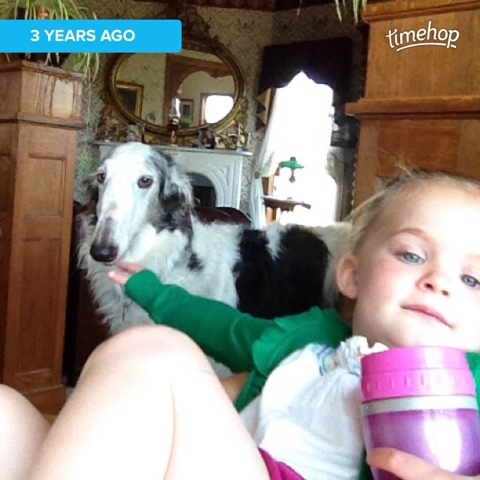 My uncle had already leapt across a dining chair and was prying the dog's mouth open. 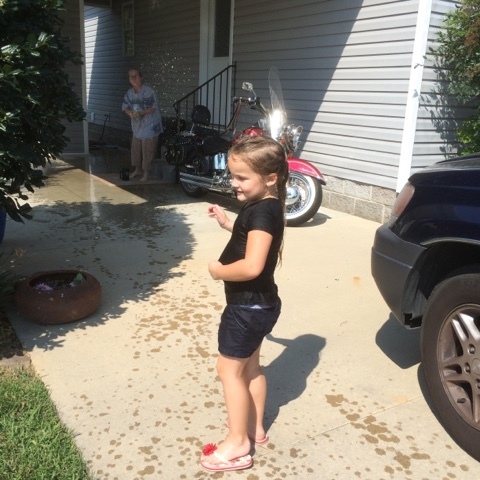 I grabbed my baby and carried her over to the sink where the water was still running. 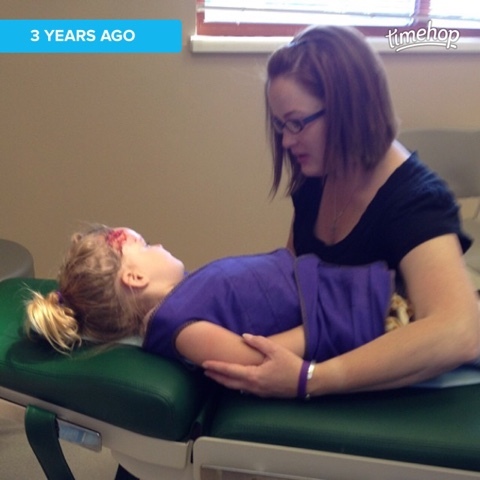 She was screaming and crying and bleeding. So much blood! My aunt ran up the stairs for a medical kit as I held my baby, calmly, almost detached. 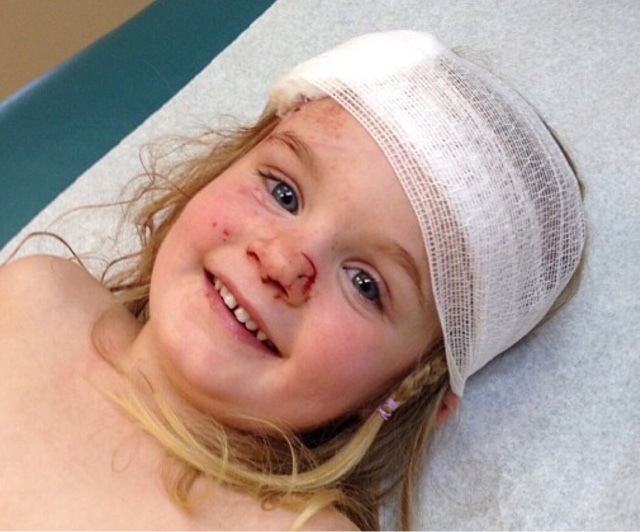 Looking at her head, I could see she had a very large gash above her eyebrow, an almost separated nose, a torn eyebrow, scratched eyelids, lips and cheeks. I could see exactly where this dog had tried to take a bite out of her, exactly where it's teeth scraped her beautiful skin. On the way, I had to call my husband at work and try to explain to him what had just happened. He wasn't due to fly out for the wedding for another 2 1/2 weeks, and I knew this was going to upset him. Thankfully, he remained as calm and logical as I do in these types of situations, and simply asked that I take good care of her. 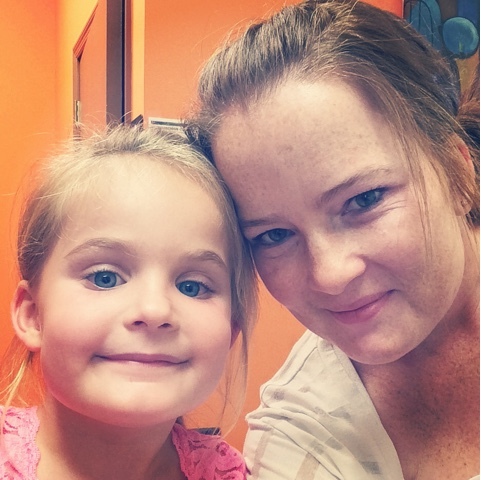 Upon arriving to the clinic, we were given the option to either have the wounds stitched then, by the doctor on hand, or wait until 7:00am the next morning for the pediatric plastic surgeon to take care of them. Given the nature, size and location of the wound, and the fact that she's a girl (not that boys aren't subject to being self-conscious of scars), we opted for the pediatric surgeon. 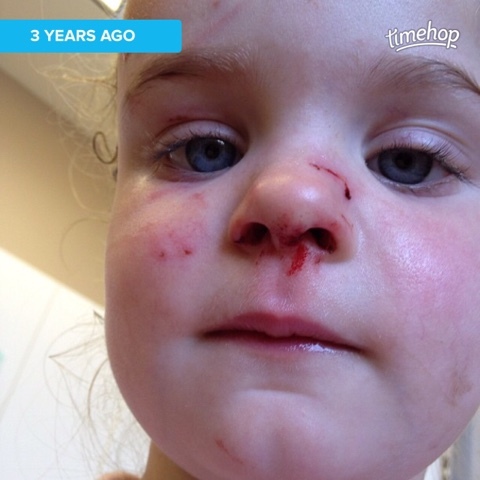 We were assured that the stitches could wait until then. 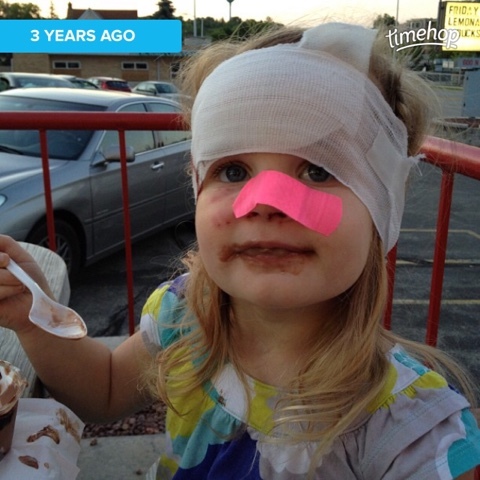 They applied a clear numbing gel and white gauze bandage to the largest gash, covered her nose wounds with a bright pink bandage, gave us a prescription and sent us on our way. We went to Wal-Mart for that prescription, wouldn't you know. Me with my white, blood-stained shorts and blood smeared skin/face. 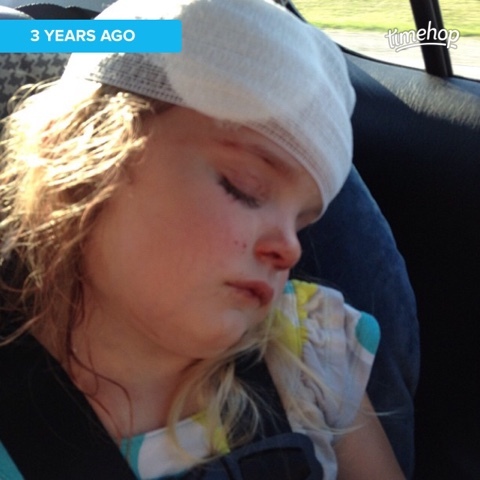 Her with her white gauze wrapped skull and numbing gel/blood oozing wound. What a "People of Wal-Mart" pair we made, huh? I will tell the rest of the story in pictures and captions, if that's all right. My aunt and uncle never filed a police report on the incident, and I can't say that I blame them. I honestly think it was an accident. The dogs were kept separate from us for the duration of our stay. 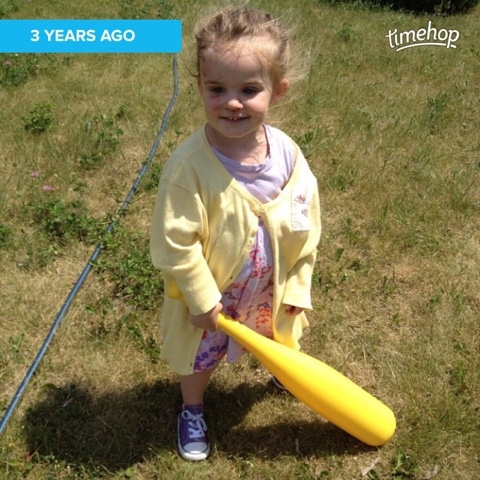 To this day, we're not sure what happened to make VaVa lunge and attack. She had been asleep on the rug during dinner and wash up. I wonder if Roo stepped on her tail or maybe she startled her when bending over to give her a hug or kiss. I'll never know. 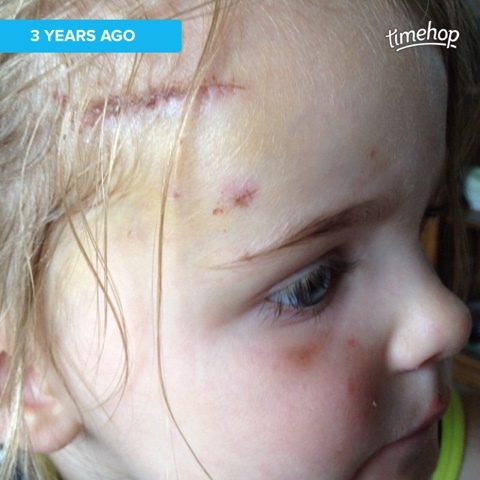 Her scar today is barely noticeable, it's prominent in the summer months when her skin turns golden tan, the scar stays white. It's half hidden in her hair, which is probably good. 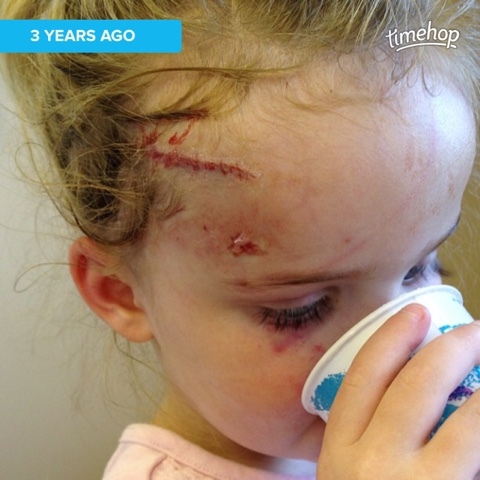 We have never made a big deal over the scar and what caused it, she is not self-conscious about it, nor is she afraid of dogs. 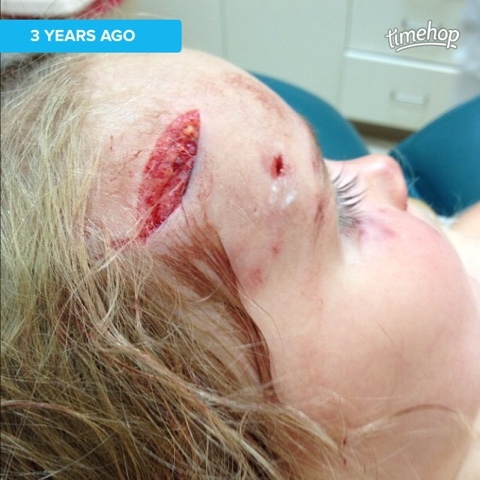 I look back at these pictures and I thank God that she is still here, whole, in one piece. 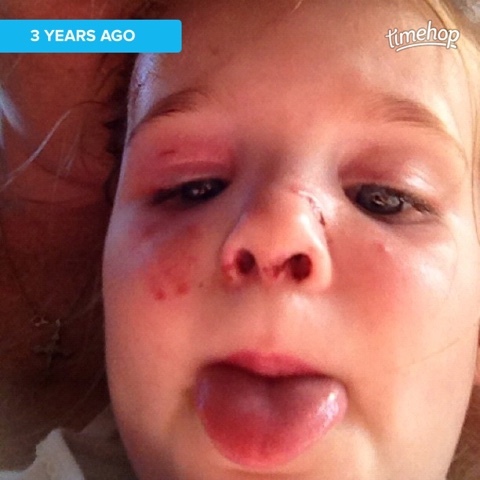 It could have been so much worse. 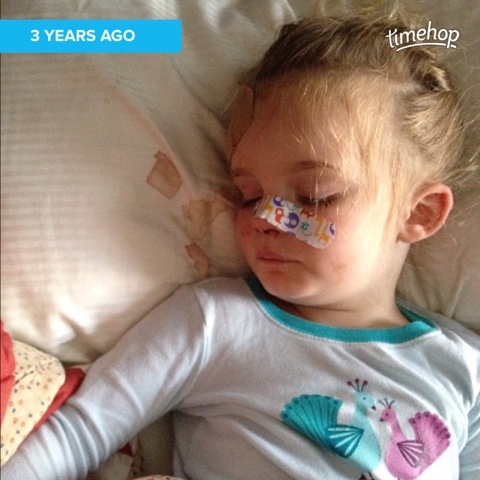 She won't wear nightgowns or pj pants or things with ruffles to bed. (We now have a drawer of designated sleep t-shirts .) 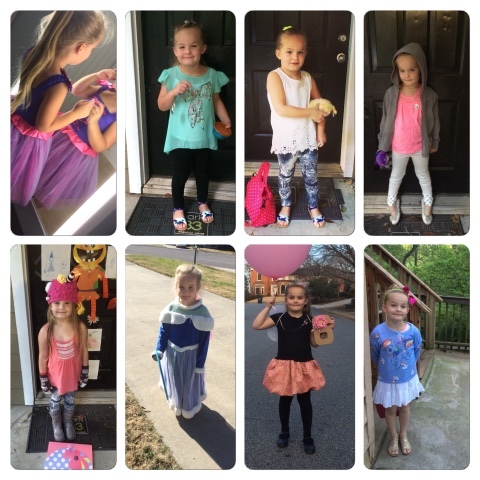 She loves leggings, skirts, dresses, tights, and cardigan sweaters. She does NOT like shorts. Not even a little bit. 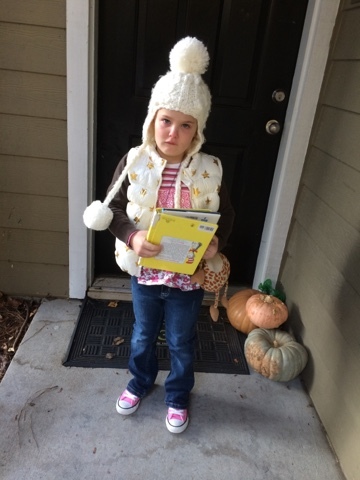 There's been one pair that I've been able to convince her to wear. ONE. The strange thing is, they're denim. I don't get it. So, I thought why lose a good thing? Better copy them and make a few more pairs! 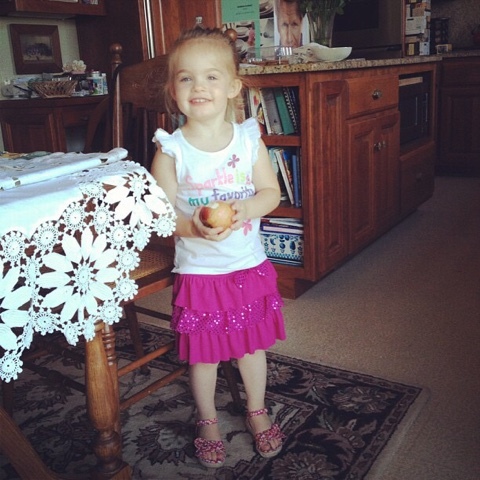 We live in "Hotlanta" she's probably going to start liking shorts sooner than later! 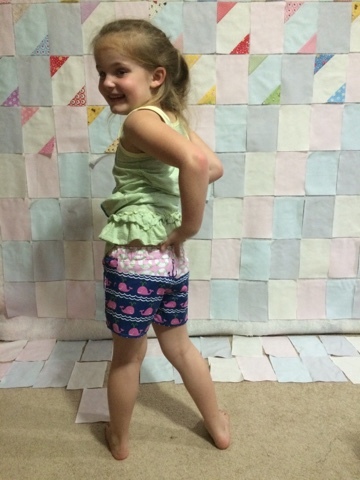 Today I'm going to show you how to copy your child's favorite shorts so you can make them again. It's pretty easy and straightforward with no crazy tools or rulers to use. Now go hunt down that pair they love and let's get started. 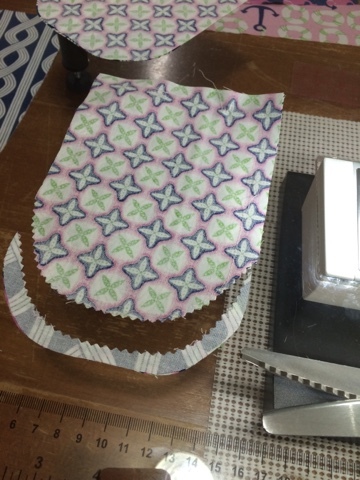 Cut the bottom off the paper bag, then cut down the back "seam"; lay it print side down on your work surface. Turn the shorts inside out, then tuck one leg inside the other. 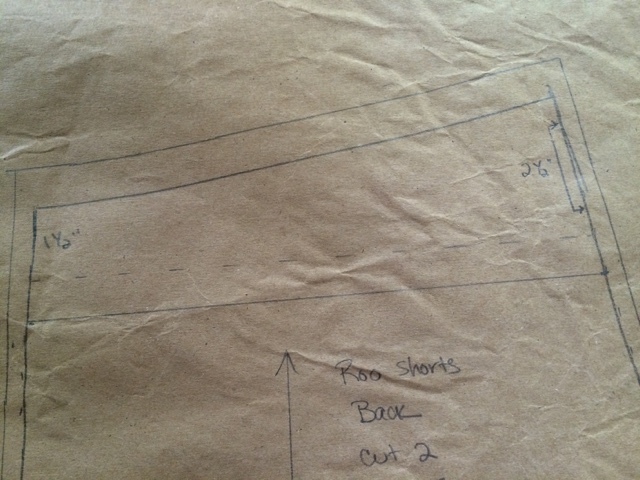 Carefully trace around the outside of the shorts, as close to the seam edge as possible. 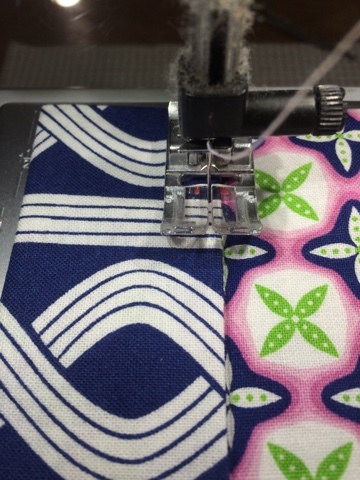 You'll need to flatten/open out the seam for accuracy. 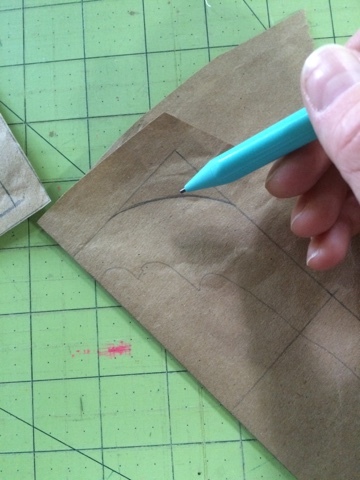 Use a grid ruler to draw the hem line. 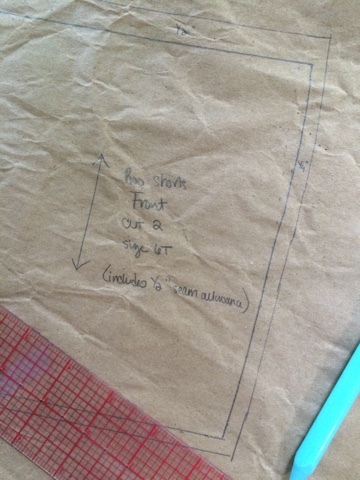 Draw the grainline (usually it's perpindicular to the hemline) and label the pattern piece with front/back, size, name etc. Repeat this process for the remaining half, whether that's the front or back. 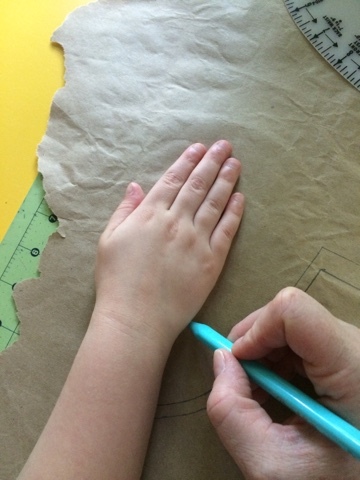 After you've traced both pieces, you can go back and clean up the lines as necessary. 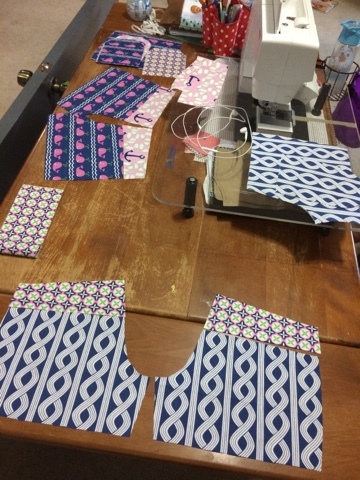 Add 1" to the top of both front and back pieces, along the waist. 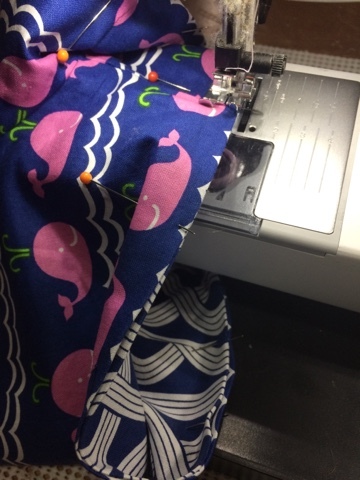 I created a back yoke by measuring 1 1/2" down from ORIGINAL waist line on the side seam and 2 1/2" down on the center back seam; draw a dashed line. Measure down from the dashed line 1/2" and draw a solid line. The solid line indicates the seam line, the dashed line is the yoke cutting line. Cut the entire back piece from the paper. 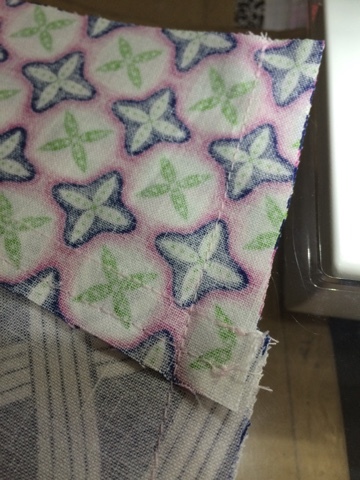 Retrace the yoke onto the paper, add 1/2" to bottom; cut new piece out and discard the original yoke. 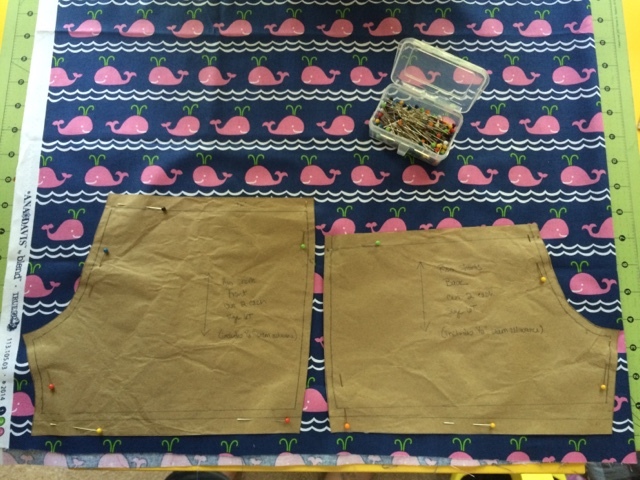 Regardless of the type of waistband the pair you are copying has, you can add an elastic waistband to the drafted pair. This is the easiest option. 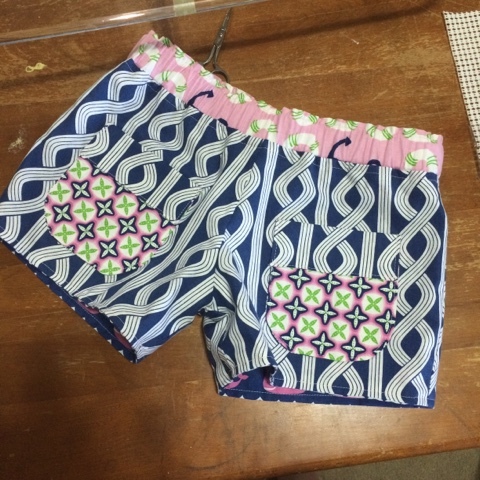 To create the waistband pattern pieces, measure across the top of the pattern shorts front and back. Multiply the measurements by two and you have the length. 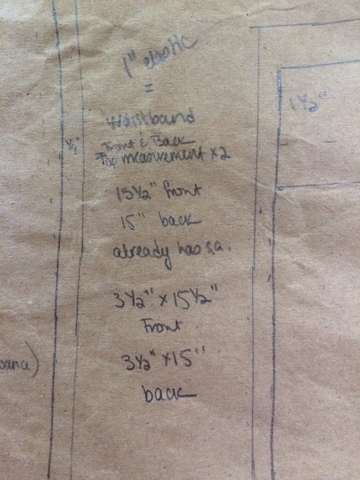 It says to make it 3.5" wide, but I think I would increase that to 4" because it was a struggle getting the elastic in! To make the front pockets, have your child place their hand, fingers not splayed, on an empty space on your bag; trace around their hand. Draw a straight line across the wrists. Measure around the hand (using the widest part of the hand and longest finger as your measuring point) about 1" on all four sides. This will give their fingers enough wiggle room. 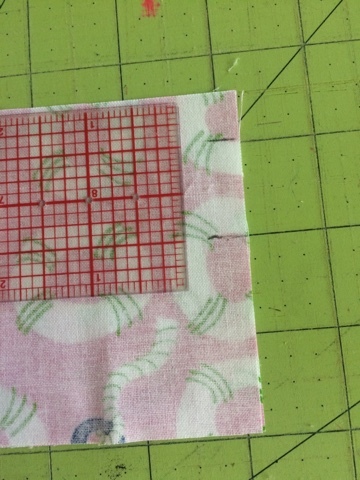 Use your grid ruler to add 1/4" around all four sides. 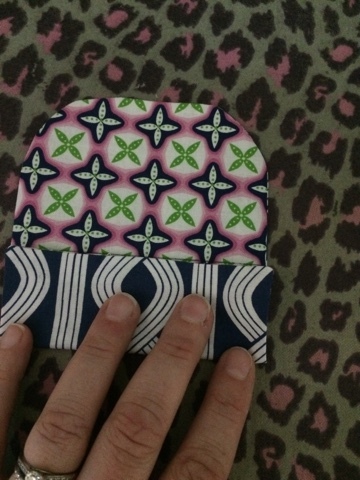 Cut around this rectangle; fold in half lengthwise. 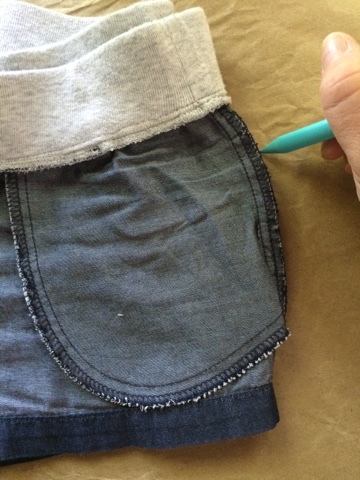 Use a cup, lid or just freehand to draw a curved line on the corners of the pocket bottom. 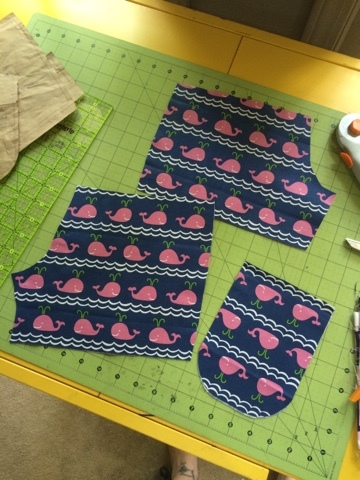 Cut all pattern pieces out, if you haven't already done so. You've just drafted a pattern! Well done! Ok, now we need to sew it up. It's probably a good idea to test these out on some inexpensive fabric or muslin first, unless you're feeling comfortable and confident. 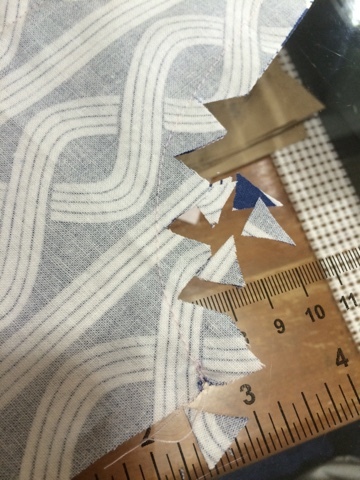 Seam allowance is 1/2" unless otherwise noted. 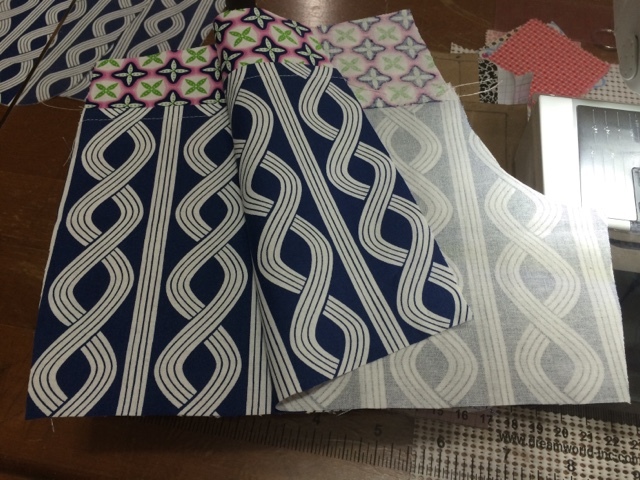 Cut pattern pieces from fabric. 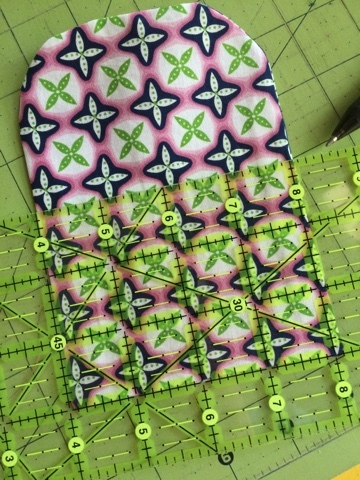 Align the back yoke pieces with the coordinating backs. 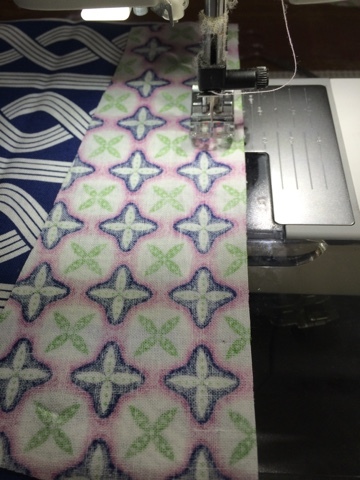 Place the yokes face down on the shorts back, matching raw edges; stitch. 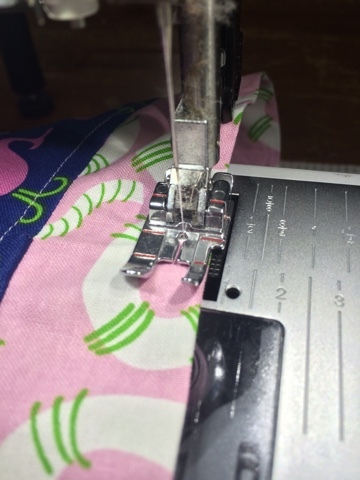 Press seam towards hem; topstitch about 1/4" from seam line. 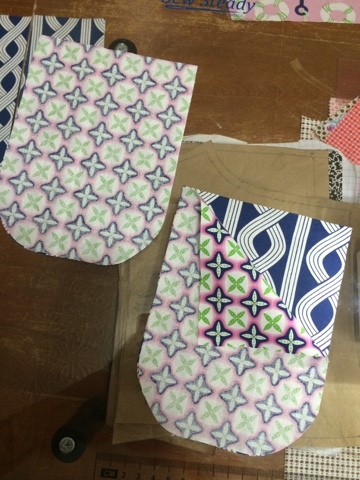 Place back pieces right sides together, matching curves and raw edges; stitch the crotch seam. Clip curves; press seam to one side as best you can. Set shorts back aside. With right sides together, place one main/reverse and one accent together . 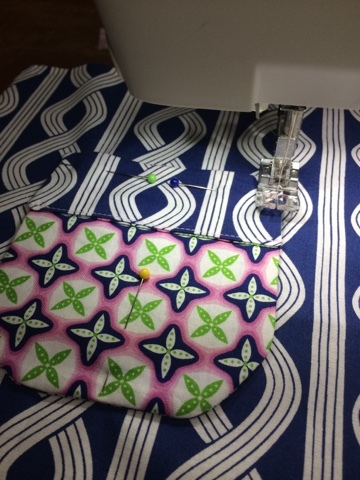 Stitch on all four sides, leaving an opening to turn at top of pocket. Be sure to backstitch on both sides of the opening! 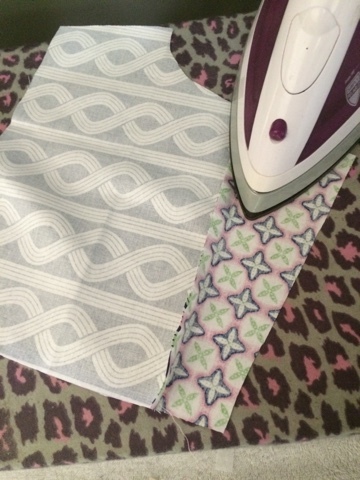 If you have pinking shears, trim the curved seam allowance with them. If not, simply notch the curves with your fabric scissors. Trim corners; turn and press. 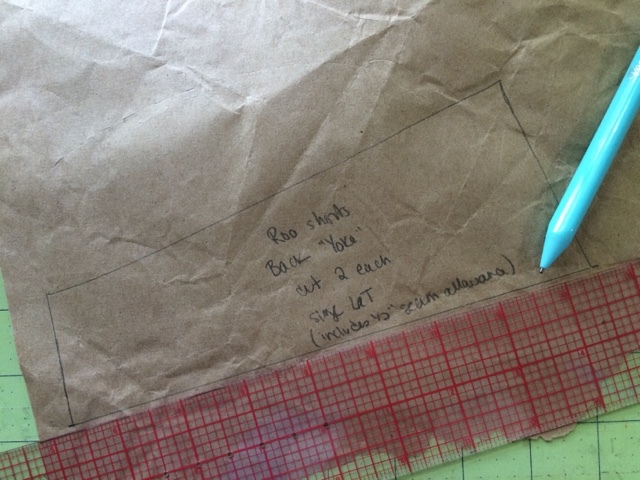 Measure and draw a line 3" down on accent side of pocket. 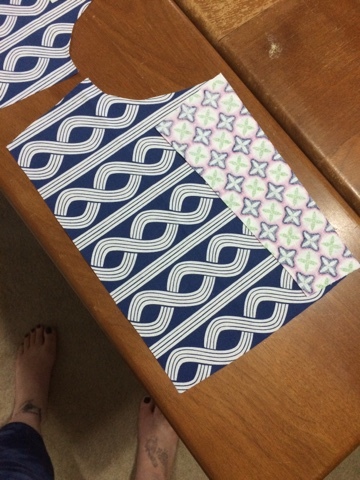 Fold top of pocket to this line; press. 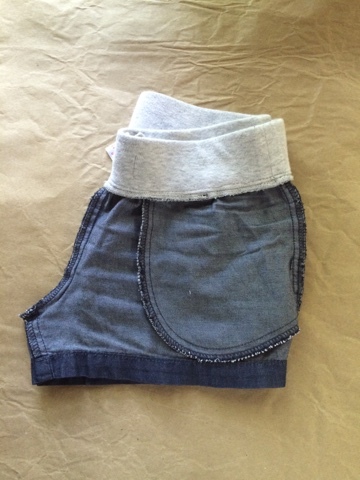 Place pocket, lining side down, on shorts front. 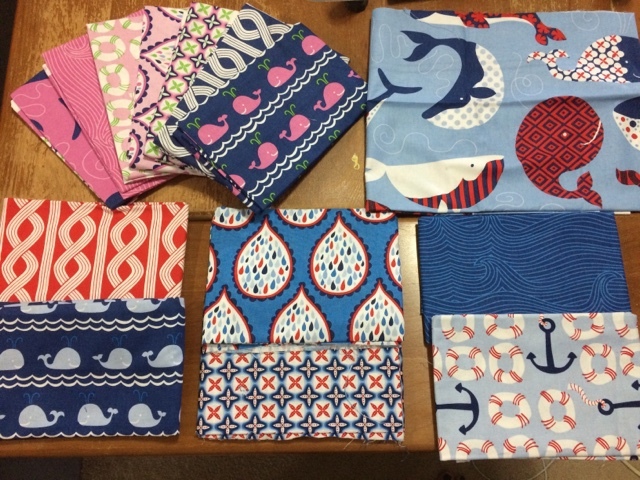 You will need to hold these up to your child to see where best to place them, or if a child is not available (or willing) you can center them, using the hem width as a guide. 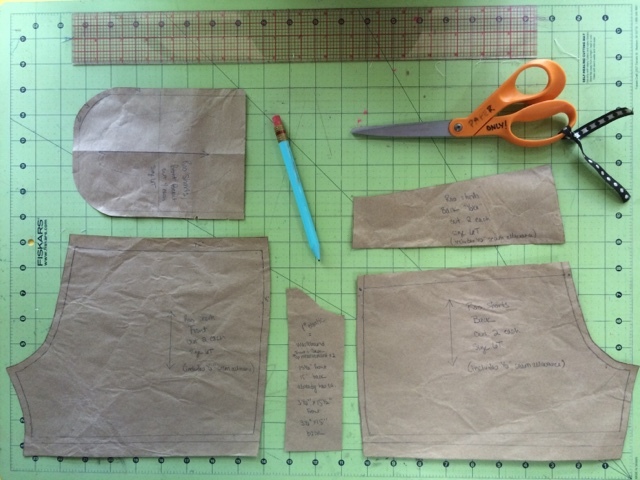 Edgestitch pocket to shorts front, making sure to backstitch. 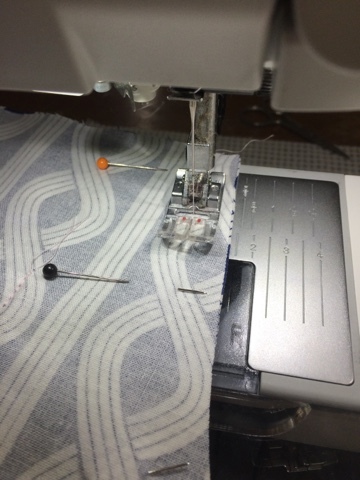 Do not sew the pocket shut! *Note the placement for the other side. 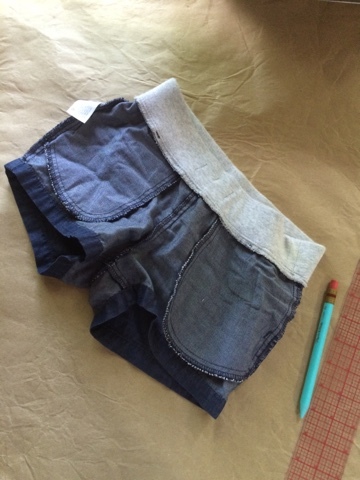 With right sides together, stitch crotch seam of shorts front. Clip curves; press seam to side. 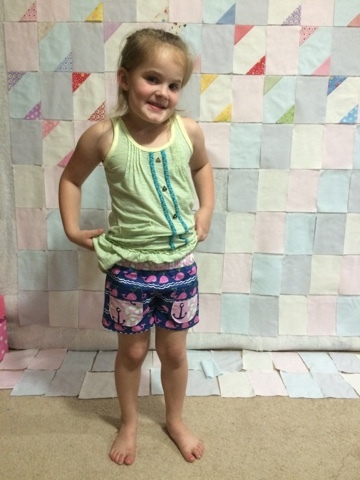 With right sides together, stitch shorts side and inseams. Repeat the above for reverse side of shorts. 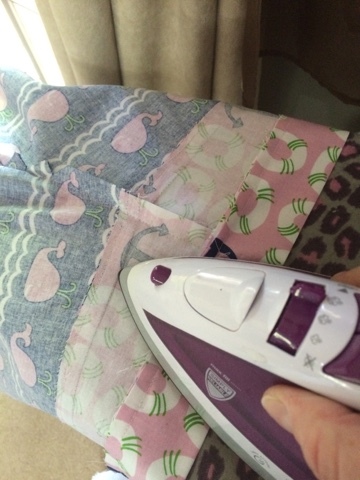 Lay the waistband front wrong side up. On one side, measure 1/2" up from bottom edge; mark. Measure 1" up from mark and make another mark. 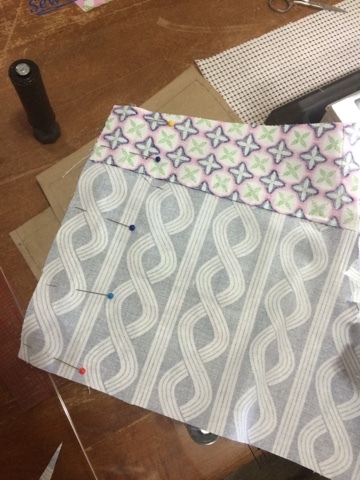 Stitch waistband front and back sides together, leaving space between marks empty. Be sure to backstitch here! 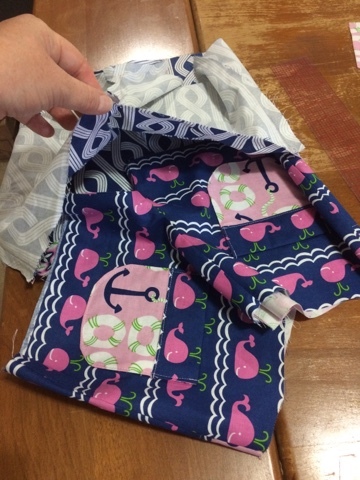 Fold waistband in half lengthwise; press. 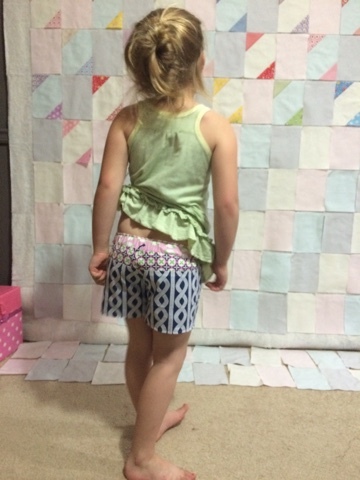 Find the center front and back of waist band by matching side seams and folding in half; press. 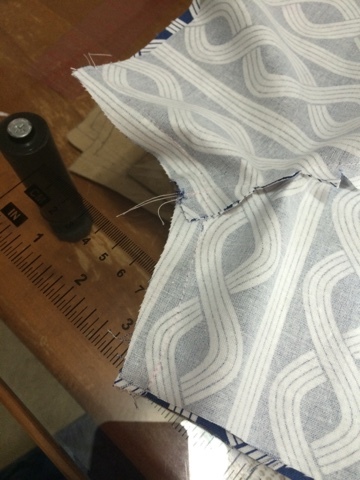 Match side and center seams of waistband to side and center seams of shorts; pin in place; stitch. 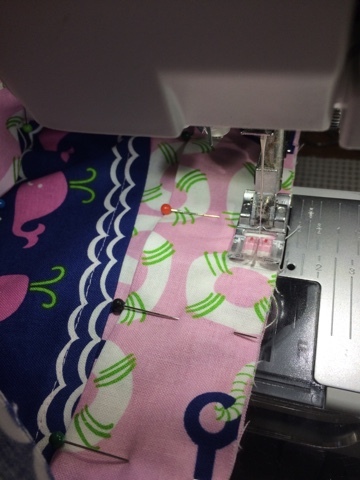 Press waistband seam towards bottom of shorts. Top stitch the top edge of waistband 1/4" from top edge. 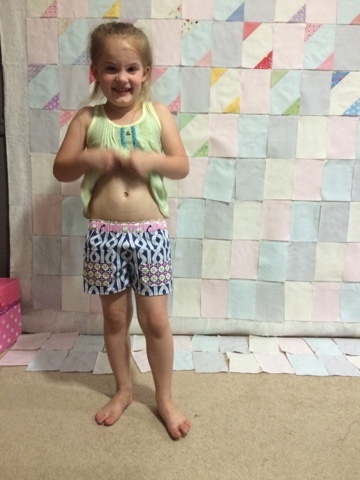 Fold top of reverse shorts down 3/8"; press. 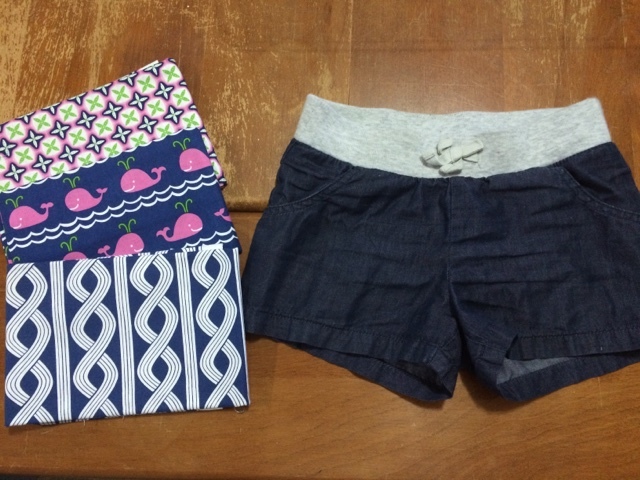 Fold hemline of shorts 1/2" under; press; unfold. 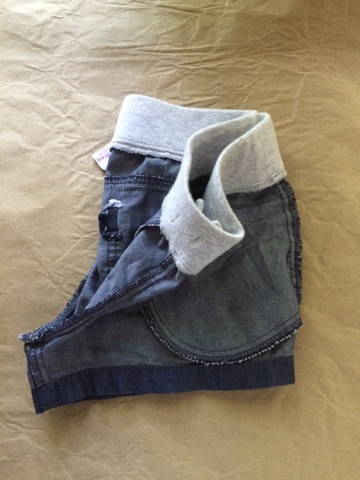 Turn shorts main inside out. (Leave reverse shorts wrong side out.) Insert main into reverse, right sides together. Stitch one leg's hemline only. The other leg will be left for turningshorts right side out. 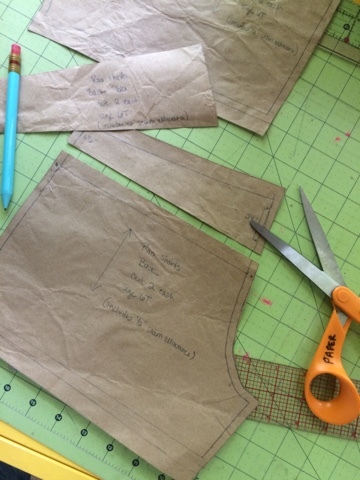 Carefully pin folded edge of shorts top over the waistband seam line; stitch in the ditch. I apologize, I didn't get a photo of this step. But, here is a handy link explaining stitch in the ditch. Turn shorts out through the unstitched leg. Refold the hemline to the inside of the shorts; pin in place. Topstitch both legs 1/8" from bottom edge. 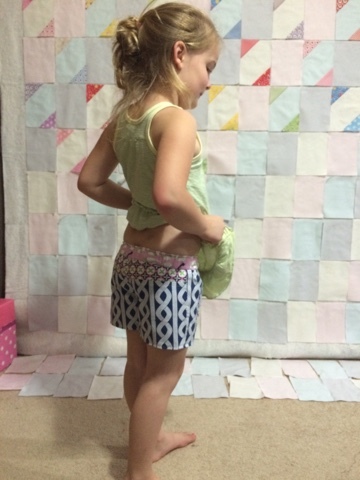 Measure elastic around childs waist, cut to exact measurement. 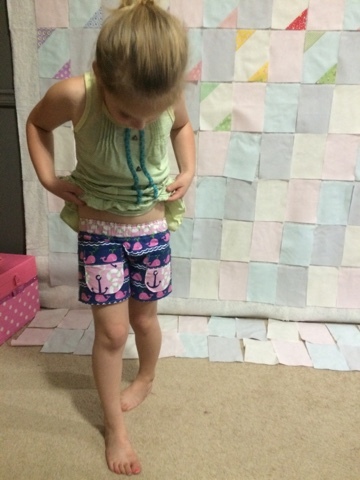 Insert elastic through the opening you created in the waistband. 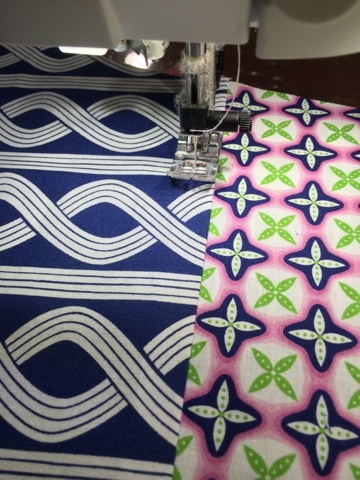 Overlap the ends by 1"; stitch together using a zigzag (preferable) or straight stitch. 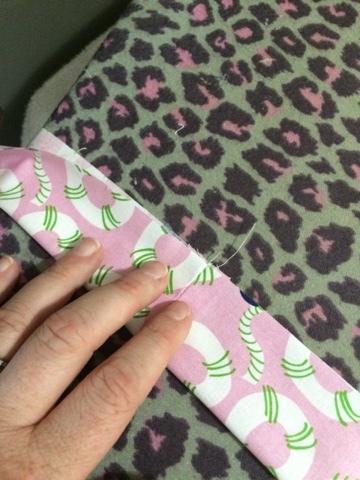 Adjust gathers, slip stitch waistband opening closed. Voilà! 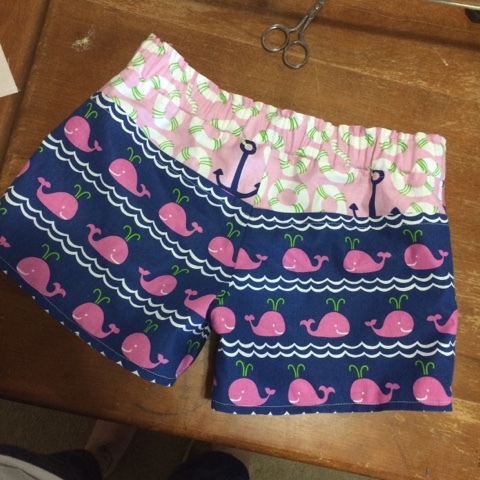 You just copied your child's favorite shorts! Way to go!